The user interface is the environment par excellence where the latest breakthroughs in the formal and factual sciences converge. In the design of the current and future interactive systems, the presentation of the content on the screen is the key to the success of the rest of the components which make up an avant-garde computer science structure. 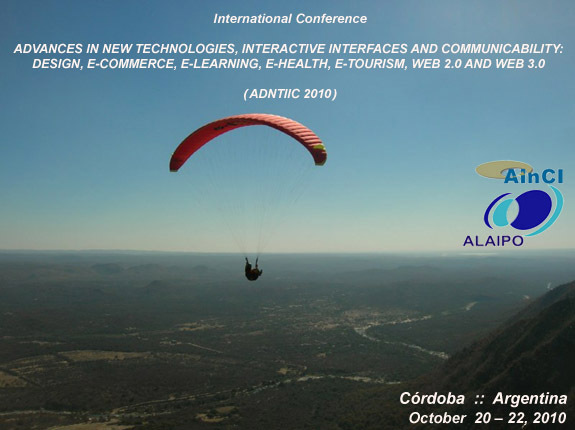 The year 2010 opens an interesting decade in which to consolidate communicability, especially with the constant (r)evolution of the interfaces of the interactive systems. Right now we are starting to see the first results of the intersection of scientific knowledge to increase the quality of telecommunications in the daily life of millions of users. However, the interactive systems will keep on programming from the point of view of design of the interfaces, using the last advances in the software and the constant progress of the hardware. A democratization of the future models in human-computer interaction will ease the interaction in the environments of immersive multimedia oriented towards education, health, work and leisure time. The current era of interactive communication makes us reflect and work daily to meet the needs of the societies to which we belong, and tends to improve the quality of life of each one of its members. In this environment the new technologies can and must be within reach of everyone. A state of the art will be the starting point of the works until reaching the future technological tendencies born from the interaction between the human being, the constant technological (r)evolution and the environment. This is a place where the intersection of knowledge deriving from the formal and factual sciences can enrich in a masterful way each one of the research projects presented and related to the last generation interactive systems online and off-line. The (r)evolution of the net must allow the human being to take a steady flight towards new horizons where the technological breakthroughs are shared by the base of the pyramid –the general public, in the least possible time. Important steps have been taken in that direction in the last years thanks to the globalization of telecommunications and social networks. However, the costs stemming from the free access to digital information and/or the legislations in force, prevent even today that flight in many societies to millions of potential users of multimedia interactive systems. In the current scientific environment we intend to build a bridge of solutions to eradicate problems, suggesting innovating solutions and future guidelines of action thanks to the lessons learned with the research works we have made or that are currently in progress. All submitted papers will be reviewed by a double-blind (at least three reviewers), non-blind, and participative peer review. These three kinds of review will support the selection process of those that will be accepted for their presentation at the international conference. Authors of accepted papers who registered in the conference can have access to the evaluations and possible feedback provided by the reviewers who recommended the acceptance of their papers, so they can accordingly improve the final version of their papers. P.S. If you wish to be removed from this mailing list, please send an email to info@ainci.com or info@alaipo.com with REMOVE in the subject line. Thanks.